Categorised: Blogging, Tips, Usability, Web Design. When I wrote this, I was thinking about: Blogging, Usability, Web Design. Usability should be a key requirement of any website, regardless of it’s purpose. As someone who deals in web app usability every day, it’s easy to look down at blogging. After all, many of the complex user interactions associated with fully fledged web apps, such as GMail, aren’t really found on blogs. There are, however, some key points of blog design that should focus on usbaility, and unfortunately many people miss them. Below I’ve listed some key points that bloggers should consider when designing, or redesigning their blog. I should point out that I take a holistic view of usability, which is something many so-called usability consultants don’t agree with. I guess this puts me firmly in the “user experience” camp but I fail to see the difference between the aim of the two approaches. So what areas should blog design concentrate on when thinking about usability? Most blogs have a purpose. Whether it’s to get across a point of view, promote a product or service or cover the latest news, every single one has a purpose. It’s key to convey this purpose to your readership, especially if that purpose relates to an action you want the reader to take. In these cases, the blog becomes an extended sales page, and so should contain many of the same elements. It’s probably best if I give an example. I stumbled across a blog called Scribe Fire earlier. It’s a fairly nice looking blog, very clean and easy to read. 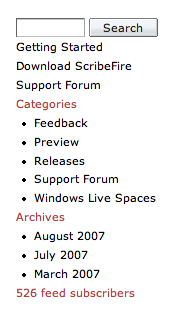 Upon looking at the front page it’s obvious that the blog is for a product called Scribe Fire. That’s all well and good, lots of software products have blogs these days. What makes this blog different is that the purpose of the product isn’t stated anywhere. I defy anyone to explain to me what Scribe Fire is from reading the first page of the blog. You can see some recent changes and features, and I know what the latest version is, but I don’t know what it actually does. This is a bit of an oversight by the designer and is compounded by two things. Firstly, this is the landing page of the www.scribefire.com domain. This isn’t a blog linked to from the “main” site, as many product suppliers do, if someone hears Scribe Fire they will end up here. Secondly, there aren’t any clearly worded links that would point to the purpose of this piece of software. There’s a “Getting Started” link, which implies that this is where you go after installing the software. Following this link confirms this. 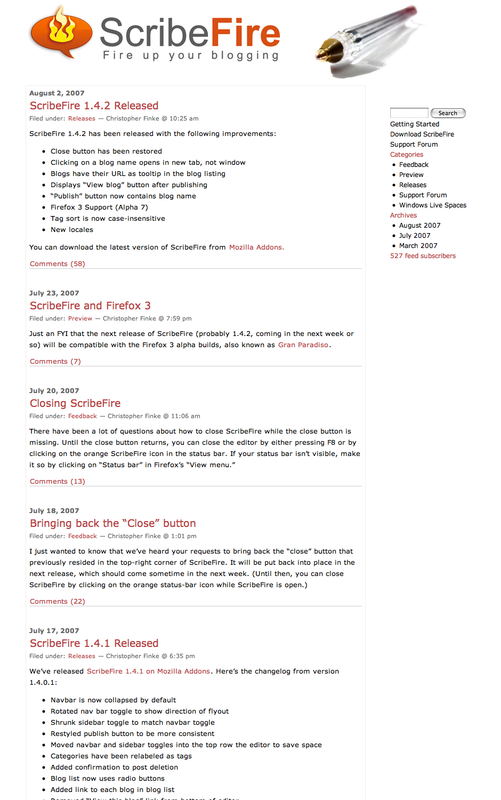 By the way, Scribe Fire is a FireFox plugin that allows you to quickly post content to your blog. Why they don’t have that simple text anywhere on the front page is beyond me. You can get a description of what Scribe Fire does by clicking on the “Download” link (which actually takes to to a completely separate site), but why would you want to download a piece of software without knowing what it does? Categories, Tags and Archives. Oh My! To access the vast majority of content on a blog, a reader is going to have to leave the front page. When exploring a blog, there are a few ways the content may be organised. Firstly, there are the “Archives”, which are typically organised by date. Then you have the Tags and the Categories. Personally, I don’t see the point in the date based archive. If I’m navigating a blog, I’d have no way of knowing when a post I’m interested in was actually posted. I wouldn’t know whether to go to September 2006 or April 2002 to look for a specific post. So I’m definitely a fan of Tags and Categories. There are some problems with providing links to Categories and Tags, namely that there tend to be a lot of them. There are a few options available, like listing them in the sidebar, Tag Clouds or putting them in a drop down list. I favour simply listing links for two reasons. Firstly, it follows the web usability convention of linking to new pages. Secondly, I’m not a fan of using drop downs to link to other pages. Why not? Well, drop downs are essentially form elements. They are typically used for providing information to a page, things like selecting a colour when buying an item of clothing. Using the same page element to navigate away from the page will confuse less experienced users. Another factor that will confuse less experienced users is the multiple ways of dealing with navigation drop downs. Some will change page as soon as the option has been selected where some require a button to be pressed. In my personal experience, I’ve found it difficult to label and name drop downs such as these effectively. 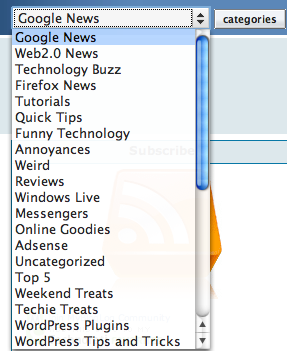 For example, take a look at the category drop down at Techie Buzz (screenshot to the right). By clicking on the “categories” button will I get taken to a list of categories, as the name implies, or the category I’ve chosen in the drop down, which is what happens. There is also a default category, which further confuses the issue. I’ll keep this one short and simple. Just because it’s a blog, there’s no need to treat links differently to any other web site. So, they should be carefully and descriptively worded, underlined and relevant. I can’t click something if I don’t know it’s a link. Many forget that most blogs do still have forms within them. The most common example is the comment form which, despite it’s simplicity, can still cause problems. Similar to the Links point above, there’s no reason to not follow standard usability guidelines just because your on a blog. So, something you may want to concentrate on. Readability – I’ve lost count of the number of blogs that, for some unknown reason, have tiny text boxes. There are two ways this can play out, either the box itself is too small or the text within the box is too small. At the end of the day, I link back to my blog when leaving a comment, so if I leave a poorly conceived comment, or one riddled with spelling or grammatical mistakes, it’s going to negatively impact on the image of me as a blogger. So I’d rather not run the risk. To solve this, you may want to look at Forms that Leap Out. Required Fields – Most forms have compulsory elements, make sure your readers are aware of what they are. Feed Back – Even if you design the perfect form, people will still make mistakes. When this happens you need to provide them with usefull feedback. This should include stating exactly what’s gone wrong, why, in which fields and how they correct it. Tone is very important when providing this feedback, and should be helpfull and supportive, not condescending. You should also leave the data the user entered in place to avoid the situation where a user spends ten minutes writing a comment and then gets it cleared when they put a typo in their email address. Spam Prevention – Unfortunately, spam prevention needs to be considered by all bloggers. Most use a tool like Akismet to catch spam after it’s been submitted but increasingly CAPTCHAs are being used. If you use CAPTHA you need to consider a few things. Firstly, you need to offer an audible challenge for those who cannot actually see the CAPTHA test. Secondly, there are CAPTCHAs which use mathematical questions, or similar. Be carefull when setting the difficulty and be sure not to discriminate against those who’s first language is not your own. Even better, I would recommend using the previously mentioned ProtectWebForm CAPTCHA which tends not to even challenge genuine users. I hope you enjoyed this post. I deal with usability every day and I really can’t overstate quite how important it is. With that in mind I’m announcing two things. Firstly, I’ll be redesigning this blog with an emphasis on usability. Secondly, I’m offering free usability assessments to bloggers. When I was doing this as a job, I would charge over £50 ($100) for this, so take the opportunity while you can. If you are interested, leave a comment or send me an email and I’ll consider you. Each assessment can take a long time, so I’m only looking to do one a month, depending on the level on interest.